This is going to be an unusual article. Instead of explaining in great detail the nature of Christian liberty, I'll just touch on it and then discuss some decision-making I did. It came about while considering artwork for the fifth annual Question Evolution Day in 2016. If someone wants to go to church on Saturday, that's fine for them. For that matter, any day is fine. I go on Sunday, which is called the Lord's Day. None of us can look down on another for our choice (Romans 14.5-6, Colossians 2.16). Similarly, if you refuse to celebrate Christmas, Easter or whatever because of your convictions, let that be settled in your own mind, but don't judge those of us who do choose to celebrate certain holidays. One item commonly discussed regarding Christian liberty is whether or not we can consume alcohol. Romans 14 is commonly used in discussing that topic. People compare questions raised to Paul about eating meat sacrificed to idols with the consumption of alcohol. To eat that meat, to drink that alcohol — yes, it's fine, but you need to have consideration for the conscience of someone else. We have Christian liberty...and I'll let you research that matter further yourselves (I'll start you out with this link). Just remember, you have no business judging someone who takes a drink, goes to church on Whateverday, or celebrates a holiday. It seems that quite a few Christians have been cranking up the judgmental attitudes. This not only shows a great deal of pride on their parts, but ignorance of Scripture. I really don't like being on the receiving end of sanctimonious Christians, possibly because I'm aware of my own failings in that area. "Is there a point to this, Cowboy Bob?" Yup. I wanted the artwork for QED to be different and also humorous, even thought I'm over 16 months early for the event. I thought it would be cute to use a "fifth" booze bottle and make a label (I did not spend much time on the one pictured because it's only an illustration for this article). There were some logistics difficulties. Wow, was I uninformed! They don't make fifths (1/5 of a US gallon) anymore, that stopped in about 1980. So my humor was outdated. Then, finding a public domain picture of a fifth of alcohol was difficult, though I could get by with clip art like the one above. More importantly, what about the reactions of Christians? I think my liberty would allow me to use the booze bottle image, but it would backfire; people would be put off, not encouraged. Although I believe I have the liberty, I also have the responsibility to be considerate. "Weaker" Christians? Well, I don't think so. People have lost loved ones because of drunk drivers, or been hurt by alcoholics, or are recovering alcoholics, and so on. Seems like I would be rubbing their noses in it with my Christian cuteness. 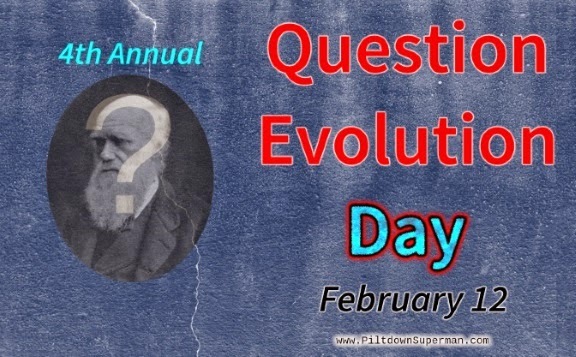 Yes, I can insist on my "right" to use a bottle of alcohol as the logo for the Question Evolution Day event. But I would be needlessly provoking and offending brothers and sisters in Christ by doing it. My call is: Drop it. Insisting on my right would just be selfish and possibly be harmful. Does this make me noble or extra spiritual? Not for a minute. But I'm "at peace" with the decision. Besides, I don't like being hollered at. A "win-win situation", as they say. Hey, I told you this was going to be an unusual article.